4 bedroom, 2 bathroom (plus additional WC). Sleeps 7 comfortably. A spacious family flat overlooked by Mont Blanc in an attractive building with access in summer to swimming pool and tennis courts. Le Bettex is a pretty ski-station in the St Gervais - Megeve domaine and offers in summer all mountain activities such as walking, camping, riding, cycling, and golf. Resort details: The ski station of Le Bettex is a satellite of St Gervais and is integrated into the Megeve domaine, providing in all about 360 km of piste and over 100 lifts. The flat is 75 m from the Chenaz piste which leads to the new Mont Rossets chair lift (and ticket office). This takes you up the mountain in 8 minutes. The Mont Blanc ski-pass offers access to a number of other resorts. There is also scope for cross country and ski touring over a vast area. Summer information: The flat is a lovely base for a wonderful summer holiday. The flat is adjacent to the co-proprietors swimming pool and tennis courts. Summer activities include golf (championship courses at Megeve and Chamonix), walking, camping, riding, cycling and (naturally) eating. Summer skiing is also available on Mont Blanc. The flat is now equipped with superfast wifi, plus DVD. There are three enclosed bedrooms: one with a double bed; one with bunks; and one with bunks and a separate single bed. There is also a sofa-bed on the mezzanine, and so the apartment can strictly sleep 8; but 7 is the optimum number in enclosed bedrooms. the flat is spacious, the rooms are big, everything we need is inside, it feels like at home ! only a very short walk to start skiing. It was really a great stay ! Thank you ! We had a super holiday, and the apartment worked perfectly. 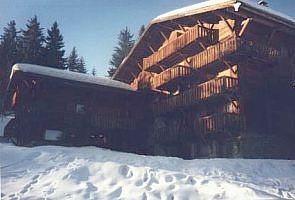 with easy access to the piste and ski lifts. The apartment is spacious therefore we did not feel in any way cramped. Also the apartment is very well stocked with DVDs etc and the kitchen is well equipped. Everithing was fine, and we enjoyed this flat very much ; everything was perfect ; we felt at home in it. We would go back certainly with pleasure !